The Downeast & Acadia Region is famous for its rocky shoreline, scenic harbors and mountains-to-the sea views. This area also is home to Acadia National Park, the most frequently visited location in Maine. The region offers visitors numerous ways to explore and preserve its natural beauty. Located in Trenton, halfway between Ellsworth and Bar Harbor, this convenient, year-round facility services Maine’s Downeast coastal region and one of America’s most-visited national parks, Acadia National Park. Bustling towns, scenic harbors, picturesque bayscapes, delightful villages and spectacular mountains-to-the-sea views make Downeast hugely popular among cyclists. The region is home to breathtaking Acadia National Park, as well as numerous easily reached islands. The BusBank is a nationwide charter bus service that is able to offer a wide variety of options from mini bus service to full size coach buses. 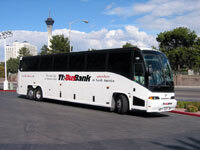 The BusBank can handle groups from 15 passengers up to large events of tens of thousands. The BusBank services all regions of Maine. Custom Coach and Limousine's fleet consists of executive sedans, vans, stretch limousines, SUVs, mini coaches, school buses, 29, 49 and 57 passenger Motorcoaches and our all new 20 passenger Limousine-Party Coach. 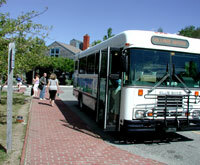 A private, non-profit agency that operates flex-route public bus service in Hancock County as well as commuter services in Bar Harbor and Mount Desert Island with once weekly service to Bangor and Ellsworth. This free commuter assistance program provides services to commuters who live, work, or travel throughout the State of Maine. Emergency Ride Home Guarantee. 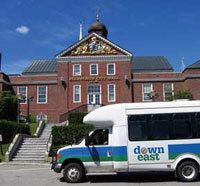 Operated by Downeast Transportation, Inc., is a seasonal fixed-route public bus service. The Island Explorer operates seven days per week between Trenton, Mount Desert Island and Acadia National Park. Maine Charter Bus Rental Services - US Coachway Inc. 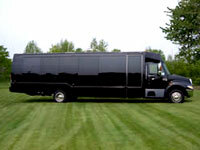 US Coachway Inc. offers charter bus service nationally and throughout Maine. 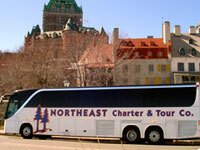 Northeast Charter & Tour Co., Inc. offers extensive passenger transportation services, ranging from passenger vans for airport shuttle service, minibus, to a full 56-passenger charter bus. Operates a public bus service between the Pleasant Point Indian Reservation and downtown Calais on Monday thru Friday. Established in 1985, V.I.P. specializes in motorcoach tours and charters of all kinds serving the United States and Canada. VIP also services USM Portland-Gorham. The Downeast & Acadia region is home numerous scenic byways, which offer visitors glimpses into small, coastal villages ripe with wild blueberries - and the open waters surrounding Mount Desert Island and Acadia National Park. Sometimes, the only way to get to your destination is by car. In fact, some of the most beautiful and remote areas of the state can only be reached by driving. Make the most of the ride by traveling along one of many scenic byways that wind through the state. 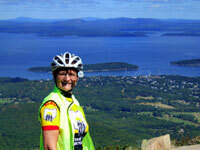 And if you need directions or lodging along the way, checkout our information on Maine's Visitor Information Centers. The M/V St. Croix and the M/V Katherine provide seasonal service between Bar Harbor and Winter Harbor, Maine, with connections to the Acadia National Park Island Explorer Shuttle Bus. The ferries operate seven days a week, June 23 to September 30. Also offering excursions and cruises. Beal & Bunker Mail Boat and Ferry. Year-round service, leaving from the Northeast Harbor Town Dock. One of five Bay of Fundy Isles, Campobello Island is part of New Brunswick, but accessible by mainland from Lubec, Maine. Enjoy two spectacular parks, or visit FDR's summer home. All trips do a loop between Great Cranberry Island, Islesford (Little Cranberry) and Great Cranberry. Enjoy panoramic views of the mountains of Acadia National Park, as you cross Frenchman's Bay in our ferry. Hike, bike, picnic or visit a museum. Seven Days a Week — May 26 to October 1. Deer Island is a Canadian island located in the Bay of Fundy at the entrance to Passamaquoddy Bay. At 17 square miles, the island is the largest in the West Isles Parish which had a 2001 population of 851. Deer Island is entirely rural with the major communities being Fairhaven, Leonardville and Lord's Cove. The economy is primarily driven by the fishing and aquaculture industries although tourism is growing in importance. Visitors to the Campobello area who wish to continue on to the New Brunswick mainland can save nearly 100 driving miles by hopping on the M.V. "Island Hopper." Save nearly 50 driving miles from the Eastport area aboard the M.V. "Fundy Trail." The ferry "Captain Henry Lee" serves the island of Frenchboro from Bass Harbor on Mount Desert Island. This island community is just over eight miles from Bass Harbor, and can be reached via ferry in under an hour. The town of Frenchboro is actually made up of 12 islands. They are: Long Island, Crow Island, Harbor Island, Mount Desert Rock, Great Duck Island, Little Duck Island, Black Island, Placentia, the two Green islands, Pond Island, and Drum Island. Grand Manan Island lies a mere 11 km (6 miles) from the closest landfall (Campobello Island and the easternmost point of Maine) and is served year-round by a 64 car ferry making multiple trips daily from Blacks Harbour, New Brunswick. Located just south of Mount Desert Island, Great Cranberry Island is accessible via ferry from various points, including Northeast Harbor, Manset and Southwest Harbor. The island is home to a year-round community of lobstermen, boat builders and artisans. Isle au Haut is approximately six miles long and two miles wide. A section of Acadia National Park covers about half of the island. The town's year-round population of 65 grows to several hundred in the summer season. Accessible by ferry. The Isle Au Haut mailboats offer passenger and freight service between Stonington and Isle au Haut, Penobscot Bay lighthouse cruises, lobster fishing excursions for sightseers and seasonal service to Acadia National Park at Duck Harbor. Located just south of Mount Desert Island, the Cranberry Isles are accessible via ferry from various points, including Northeast Harbor, Manset and Southwest Harbor. The Cranberries are home to a year-round community of lobstermen, boat builders and artisans. The sun rises first in the small port city of Eastport on Moose Island, connected to the mainland by a short causeway. Rich in history and natural beauty, Eastport continues to serve as a commercial shipping port. The Quoddy Loop, a "two-nation vacation" loop between points in Maine and New Brunswick, Canada, relies on a series of ferries. These vessels transport travelers and vehicles among five islands and Blacks Harbour on the New Brunswick mainland. Take the Swan's Island Ferry from Bass Harbor to the unspoiled island in Downeast Maine. Once on the island, enjoy biking, hiking, kayaking and swimming. The Swans Island Museum and Hockamock Head Lighthouse provide visitors with a perspective on the island's history. 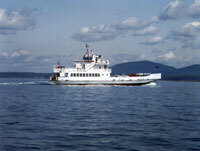 The ferry "Captain Henry Lee" serves Swan's Island from Bass Harbor on Mount Desert Island. Located in New Brunswick, Canada, and accessible only via ferry or air, White Head Island is the spot to get in touch with mother nature. It is a quiet quiet hide-away for bird watchers, geologists, naturalists, writers, artists and whale watchers.